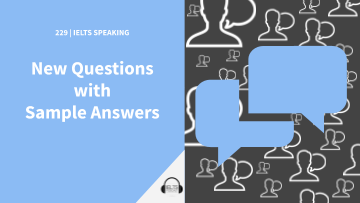 In this tutorial we answer speaking questions recently seen in the IELTS exam. We focus on parts 2 and 3. Each answer has been transcribed. Useful phrases you can use are highlighted. The audio tutorial explains why these phrases are useful and how you can use them. Tip: Listen to the audio, write down the phrases, and try and use them in your everyday conversations. Eventually they will stick and sound more natural. Well to be honest, I don’t have much to go on here, because I never met my Grandads, and my dad’s mum was retired, and we didn’t see her a lot. So I only have my Grandma to talk about. If I remember correctly, she was a typist at a school for disabled children I think. She typed up letters that were to go out to parents and people connected with the school. I think she transformed handwritten letters into typed ones because when she was working they didn’t have computers. I believe she got the job through a friend of hers. I think they were talking about it at the market, and her friend suggested she should go for the new opening at Hollybank School. It was that or either she saw an advertisement in the newspaper and applied. I would definitely not like to have this job because it requires a lot of patience and accuracy. Patience isn’t really my forte, to be honest. Also, back then I think if you made a mistake it took a lot of time, typex and effort to correct it without it being visible. This would severely test my patience. I really think it would be one of the worsts jobs I could ever be given. And that’s my small talk about my grandma’s job. Conditional: If _________ then _____ would. or a cleaner of some sort. there is little conversation or interaction needed. If you’re a native English speaker there is usually a reasonable demand for English tutoring. Also, I think if you are good in your profession it’s quite easy to get a job in a foreign country. For example, if an expert is world class in their field, I guess most universities would gladly welcome them. Some of the most common jobs include being an au-pair, or a cleaner of some sort. STORY: Last year I went to Poland and I found that a lot of the Uber drivers and food delivery drivers were foreign. I guess they didn’t need to speak the language to do those jobs. The technology does most of the communication for them. So to summarise, I’d say language jobs, domestic jobs and perhaps jobs where there is little conversation or interaction needed. Is it hard to find an interesting job in your country? Well in my country, England, there is a relatively strong job market and I guess a diverse economy. So I think yes it would be easy to find an interesting job. In fact last week I was looking on the job sites and found a few enticing job descriptions. STORY: A few years ago I lived in Spain, and when I graduated I really struggled to find any decent job for the qualifications I had. In fact, I took a really boring job working in a logistics company. That job was soul destroying, it was so repetitive, I was so happy when the contract ended. So, I think it depends on the economy of the country with regards to finding interesting an job. I think job loyalty has greatly reduced in recent years. I think people change because they can find better pay, better opportunities, and better working conditions. STORY: I was reading The Everything Store, a book about how Amazon grew into the behemoth it is now. In one chapter it mentioned how all their engineers were ditching Amazon and going to Google. It mentioned that they moved for better perks, better opportunities, more interesting projects. Also –if I remember correctly– Silicon Valley was a major pulling factor too, because Amazon is based in rainy Seattle. ANECDOTE: Personally, I was a bit of a job hopper too, although I was always considerate and gave the employer plenty of notice, in some cases I even found my own replacement. So, I think people change their jobs a lot because they want to improve their conditions, location of work and most likely their career prospects. Hmmm, I think confidence is the key to excelling in a job interview. This could be obtained by learning what is expected of you, so I guess you should do your homework about the company. Go to their blog, search the news and stuff like that. ANECDOTE: I remember when I was looking for work in Manchester, I always used to search online for the CEO’s name, and try and mention it during the interview. For example, if they asked me if I had any questions, I’d say “yes, was it David Smith’s idea to start selling in Asia, or have you always been selling there?”. However, I wasn’t really all that successful in job interviews. I think the preparation candidates should do is mainly research about the company first, then perhaps review some job interview techniques. A good employer should, look after it’s workforce, give them opportunities to grow and perhaps even push them to more be the best versions of themselves they can possibly be. But I think that’s easier said than done. So perhaps a more realistic answer would be to manage the organisation effectively to ensure job security and safety for the employees. I think an interesting job would really challenge you, for me personally it would have to be the opposite of predictive and repetitive. No two days could be the same. Other ways to characterise interesting, might be you are changing location a lot, although this would take a toll on a person’s personal life. Other ways a job could be interesting could be if you are constantly learning. This would make it stimulating. I once worked in a factory, in my hometown, and the only thing that made it interesting were the practical jokes we played on eachother. So I guess whether a job is interesting or not, really depends on the person. – What subject is it? – Why didn’t you like it? – Why are you interested in it now? What subjects did you like at school? Is learning many subjects at once good? Is it better to learn one subject at a time, in your opinion? Do you think teachers should have entertaining teaching styles? – How did you come across it? – Who are their customers? – What are advantages and disadvantages of a family business? – Why do some people like to work in large scale businesses? – What are the reasons that many businesses fail in their first year? – What are the qualities of a good business person? – Why do some people like to start their own businesses? I am hooked to Mr. Wellington’s podcast, cause he speaks so clearly (for a native speaker), I hardly miss a word he says. I also love the collocations that he repeats over and over again. I strongly recommend the learning materials included in his courses; and the systematic way he presents some IELTS test-taking techniques, which he also shares in his program. I particularly love his step-by-step formula on how to do the writing tasks to improve test performance. I am forwarding these materials to a friend who is going to take the IELTS exam soon. My only suggestion is that he include more pronunciation tips in his program, for those who have “issues” in this regard. Your comment keeps us motivated to work harder and help more people! Thank you so much for your kind words! Your suggestion is appreciated and noted. Thanks for the referral, too! You’re most welcome, Maryam! Ben is working hard to produce more useful lessons like this in the coming weeks. Keep an eye out for them!